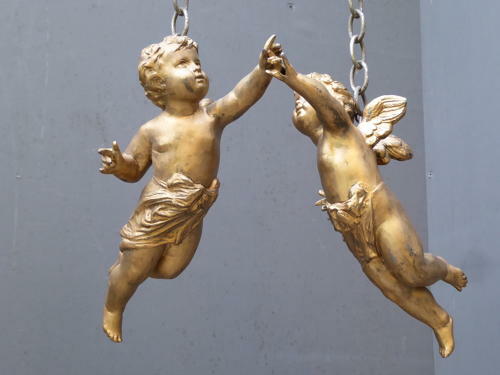 A wonderful pair of original antique hanging putti or cherubs. A beautiful pair, cast in spelter with some lovely detail & a wonderful age related patination & colour. This pair of cherubs were once ceiling lights & now make fantastic decorative items which display beautifully just as they are. Putti & cherubs can be found in both religious & secular artwork spanning the last 600 years & experienced a major revival during the late Victorian period. Wear commensurate with age, good untouched condition showing pleasing signs of age. As lamps they had wires running in through their backs & out of thier hands & have small holes here & on the bottom of their feet.